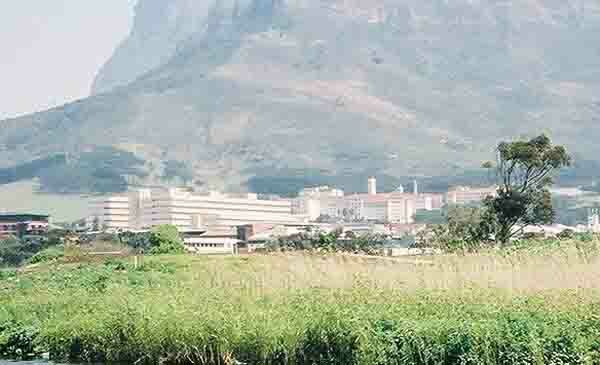 Groote Schuur Hospital is one of Cape Town's most well known hospitals and became world renowned in 1967 when the world's first heart transplant operation was done there. It is built on the slopes of Devils Peak and looks out over Table Bay. In fact it can see both the Indian and Atlantic Oceans. The hospital consists of the old building which was built way back in the 1930's and the newer more modern part which was built about 15 years ago. The old building in fact is two buildings and to gain access to them we entered through an underground passage from the parking garage. It's quite scary as you walk into these deserted passages which are hundreds of metres long and about 10 metres wide. They have recently been painted by a paint company who have also provided large wall paintings to brighten them up. In days gone by these passages were full of people waiting for treatment. Today the place was like a morgue. I'm sure that many ghosts roam the passages at night. You wouldn't catch me in them at night by myself. We took the lifts up to F Floor where we thought the Heart Transplant museum was located. The passages up there were deserted as well. Eventually we came across an outpatients division where there was some life with a hundred or so people sitting waiting to see a doctor. Day hospitals have been built closer to the people and hence there are fewer people using the facilities than there would have been a couple of years ago. We eventually found our way to the correct building which used to be the main building in years gone by. Here we had to sign ourselves in whereas in the other part we had the run of the place. On F Floor of this building we found what we were looking for. On arrival we were shown a video which told us a little about the background to the museum. After this we were allowed to explore. In the display rooms the walls were covered with old newspaper clippings of the first heart transplant to take place in the world. To me it felt like yesterday as those newspaper headlines hit me. The first heart transplant happened on the 3rd December 1967, three days after I had finished writing my final matric exam. I remember those headlines just as I can remember the headlines when President Kennedy was assassinated way back when. His headlines were three inches high on the front page of the local newspaper. The pictures of Louis Washkansky the patient and Denise Darvall the donor together with her mother are there for all to see. The museum has been built in the theatre where the actual operations took place. The suite consists of two or three rooms with glass separating each room from the other. In the first room you enter is the operating table on which Denise Darvall lay when her heart was removed from her body. Through the window about 15 metres away is the operating table on which Louis Washkansky lay waiting for his new heart. If the two patients had been able to turn their heads they would have seen each other. The operation was carried out by Professor Chris Barnard and his team. The operation was successful and Louis Washkansky lived for 18 days before dying of pneumonia. This pioneer operation opened the floodgates for thousands of such operations to be performed here in SA and elsewhere in the world. It took a very brave man to sign the papers to allow such an operation to happen. Louis Washkansky really had no option. He was dying from a diseased heart and only had a few days to live . The operation gave him a lifeline that any dying man would grab. The outcome was 18 days of better quality life for him and hope for millions of people suffering from heart diseases. When he died the new heart was removed from his chest and both his heart and Denise Darvall's hearts are now on display in the museum. It's quite amazing the difference in size of the two hearts. His was very big and hers was a lot smaller. Professor Barnard became an overnight celebrity. His second patient was Philip Blaiberg who lived for two years after the operation. Two of his other patients, lived for 18 years and 20 years respectively after receiving their new hearts. (Dorothy Fisher-18 years and Dirk van Zyl-20 years) Sadly time moves on and people get older. Many of Professor Barnard's heart transplant patients have passed on and Professor Chris Barnard has also passed on to meet them on the other side. The world and many thousands of patients owe Professor Chris Barnard a big thank you. For without the research and guts to do what was deemed impossible at the time, many would have died before their time. A visit to this museum to get the feel of the drama that must have taken place in those theatres on the 3rd December 1967 is an absolute must.